A concern that may arise in the course of estate planning is the question of what happens to the debts a person accumulated in his lifetime when he dies. Generally speaking, debts are not inherited by a person’s family members or heirs under a will. This does not mean that all debts get erased as soon as a person passes away. Creditors can still be paid after a person’s death, and this happens through the probate process. Probate is the process through which a deceased person’s will is proven to be valid and executed subject to the settlement of the deceased’s debts and any outstanding taxes. After the initial validation of the will, the executor of a person’s will notifies the creditors of the person’s death. The creditor notification can be done by notifying each known creditor individually, or by publishing a legal notice. Creditors who are notified of a person’s death use the probate process to try and get what was owed from the estate before the estate is divided among the deceased’s heirs. In Florida, creditors are required to file a claim against a deceased person’s estate within a certain timeframe. For most creditors, this time frame is three months, starting from the time a legal notice is published to notify creditors of a debtor’s death. The complete cutoff date for creditors to seek compensation if they do not receive notice is two years. After this time has passed, without the qualifying creditor filing a claim against the estate, the estate would be under no legal obligation to pay the claim. Although beneficiaries are not personally liable for the deceased person’s debts unless they co-owned the debt, a creditor can seek to have the assets the beneficiary received through the deceased’s will sold in order to satisfy a debt. In the probate process, the court can order property to be sold in order to satisfy the deceased’s debts. Creditors should be paid within a year after the notice is published, and interest may be paid under the terms of an agreement the deceased agreed to, or under the law for other creditors. If the estate has a lot of creditors and the estate cannot pay them all, the probate court can declare the estate insolvent. While this may get rid of the creditors, it also means that the beneficiaries will not receive the property or cash left to them under the will. Because creditors’ claims may affect the gifts left to beneficiaries under the will, many people prefer to transfer assets during their lifetimes or in other ways that can avoid creditor claims. The best way to decide if doing this is the best move as you make your future plans is to consult an experienced attorney to discuss the pros and cons. 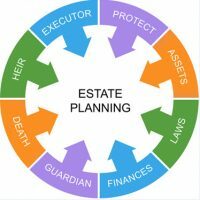 If you are thinking about getting your estate plan in order, and would like to discuss how the probate process will affect your estate plan, you need to call an experienced probate and estate planning attorney to help guide you through the possible legal issues. For more information, call the Millhorn Elder Law Planning Group located in The Villages, Florida today.